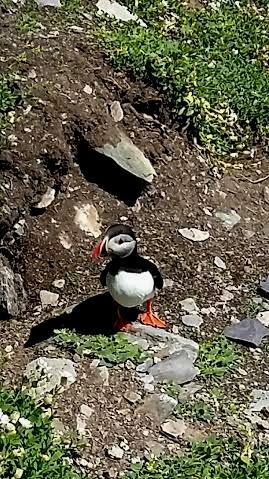 The Opportunity to See Puffins! What will you do when opportunity presents itself? Whether in business or not, it’s all the same, isn’t it? After all, you don’t have a professional life and a personal life; you have a life. 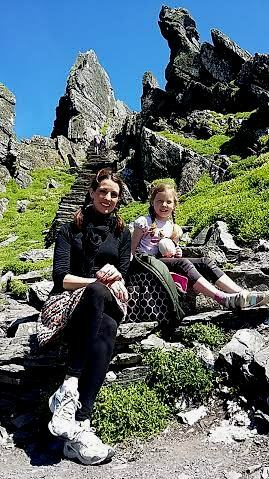 Yesterday, I took a boat two hours off the southern coast of Ireland to an uninhabited island known as Skellig Michael. 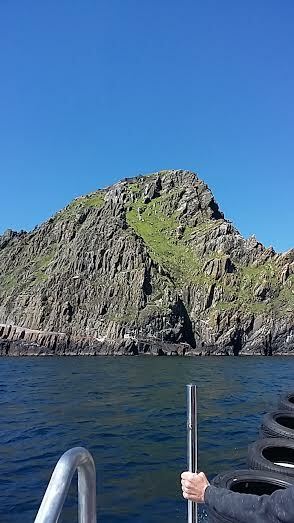 Skellig Michael as we approached from John O’Shea’s fine boat. It’s uninhabited by people – but very much inhabited by 10 thousand puffins. Yes, the alluring little sea bird with the striped orange beak and matching webbed feet with harlequin-marked eyes nest in burrows all over the craggy rock mountain which juts some 750 feet high out of the Atlantic. The steep island is a UNESCO World Heritage site and also a place I have wanted to visit since I first learned about puffins as a little girl growing up in Indiana, which as you all know is surrounded by corn fields not the ocean. A Puffin ready for his close-up! 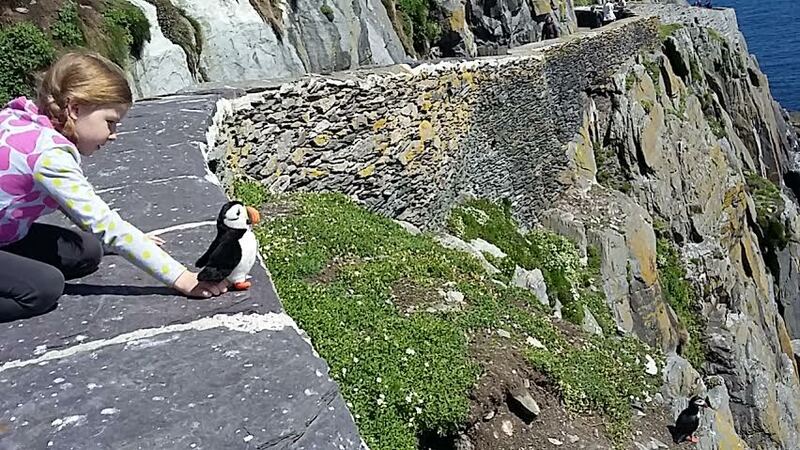 Since we moved to Ireland last September, I have been talking about my puffin dream to everyone I met. A few told me they had visited the island. Many more had not. But, like me, said they dream of going. One day. Then suddenly, a friend whose family owns a summer home on Lamb’s Head, texted me with the opportunity to stay at the house. The timing was now. Was I willing? Would I pack up, grab my seven-year-old daughter and pop into the car? Drive the two hours along tiny coastal roads I have never traveled on to a place I have never been? Book a boat trip by ringing a captain I have never met just one day prior? Inquire about space? Ride two more hours on said boat? Trek up to a remote spot in the middle of the sea? We did it! 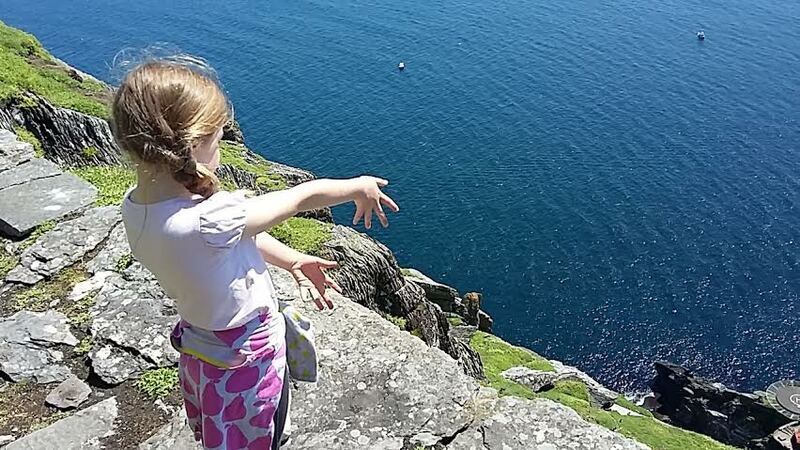 We made it to Puffin Island, aka Skellig Michael, Ireland. But I have other work to do. But, my daughter would miss a day of summer camp that has already been paid for. But. But. There is likely always going to be a but! But what if you just do it? Which is what I did, of course, or I wouldn’t be writing this. Yesterday was a lifetime experience for my daughter and me. It was a glorious, sunny day and we thoroughly enjoyed ourselves simply watching the birds. Puffins are treasures, Lulu proclaimed. 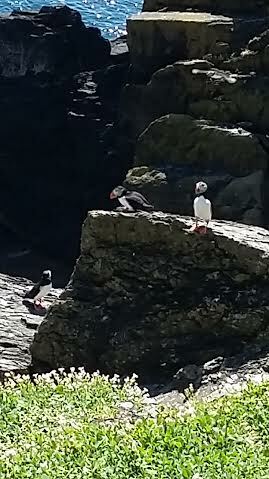 There was an elderly man on our boat who told us that although he has lived in Ireland all his life, he had never taken the opportunity to see the puffins. Finally he was doing it. Almost too late. Maybe yesterday wasn’t the perfect time, but it was the time. Maybe seeing little waddling puffins is not part of your dreams. But what is? Lulu, using her stuffed Puffin named “Muffin” as a decoy, tries to entice a real puffin. It didn’t work! When the door opens , will you hesitate, or will you rush through? I think its a beautiful thing,what you did. Life is too short to ignore opportunities whenever they present themselves. Like you rightly said : Seize the day!! Thank you so much! my photos don’t do it justice. It really was covered in cute puffins. Magical.